Here's the fourth book in the Urban Sketching Handbook series and the author is Stephanie Bower. This 112-page paperback is filled with many practicable tips on perspective drawings and there are lots of wonderful examples from other artists as well. The tips are concise and clear, and examples are accompanied by insightful explanation. 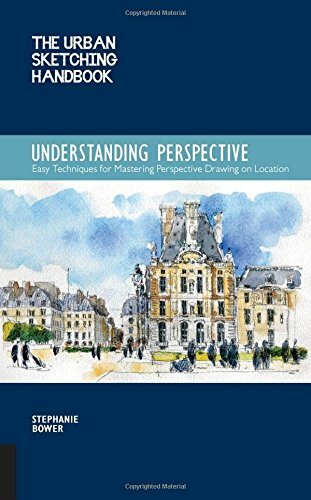 Learning perspective does not have to be difficult and in this book it shows you very quick and easy steps to apply perspective concepts to what you see and draw. You get to see beautiful watercolour sketches by Stephanie Bower herself, and also from perspective masters like Michel Gerard, Lapin, Paul Heaston and many more. Prior to putting out this book, Stephanie Bower also has a Craftsy course on perspective called Perspective for Sketchers. If you learn better buy watching videos, that's the course I would recommend. I recognised familiar content from the course that are also included in this book. So if you get the course, this book can serve as a good reference to recap the concepts. Overall, it's a fantastic book for beginners and intermediate artists who like to sketch on location.